The Genetic Genealogy Standards were created to help educate people about the possible outcomes and limitations of genetic genealogy testing. One of the possible outcomes is misattributed parentage, or the discovery that a supposed genealogical ancestor is not in one’s genetic line. 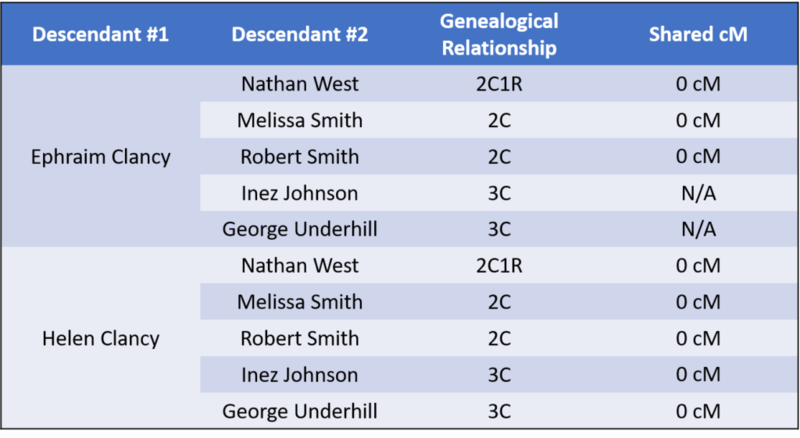 Many correctly point out that a misattributed ancestor is still be a social ancestor firmly rooted in one’s social tree, although it is potentially important to know when an ancestor is not one’s genetic ancestor. Here we will look at a real-life example of how DNA testing uncovered a family secret nearly 100 years old. The Clancys are a family of interest for me, and I wanted to test several descendants of the immigrant family using autosomal DNA. This would confirm the family tree, find other people related through this family, and potentially give me leads back in the originating country. Since I am not a descendant through an unbroken male line, I also wanted to find a Clancy male who would be willing to take a Y-DNA test. I could learn more about the ancient origins of the Y-DNA line, and potentially find matches that I could work together with to extend the family tree. I had already tested two great-grandchildren of the immigrant couple – Melissa Smith and Robert Smith in FIG. 1 – and these would be a great starting point for the Clancy Study. Now I just needed to find other willing descendants of Daley and Mary (Shane) Clancy. We will reference this chart often. You can click on it to enlarge it, and you might want to print it out or open it in a new tab to have it handy. Before DNA hit the scene, I’d spent a great deal of time researching the Clancy family and documenting the descendants. In the late 1990’s and early 2000’s I wrote to many descendants and received magnificent letters back describing what they knew about the family, each containing a tidbit of lore or history about the Clancys. Many of that older generation are now gone, and these letters are invaluable treasures. Because I’d researched the family, it was an easy matter to identify a living male Clancy descendant – Ephraim Clancy. Once I contacted him, he was happy to take a Y-DNA and atDNA test. His sister – Helen Clancy – was also happy to take an atDNA test. Referring to FIG. 1 again, you can see that Melissa Smith and Robert Smith are second cousins to Ephraim Clancy and Helen Clancy. This was perfect, as there was a guarantee that these second cousins would share DNA (to date, no one has ever proven a second cousin or closer relationship that does NOT share a detectable amount of DNA). Additionally, testing Melissa and Robert Smith had revealed other descendants of Daley and Mary (Shane) Clancy already in the testing company database. 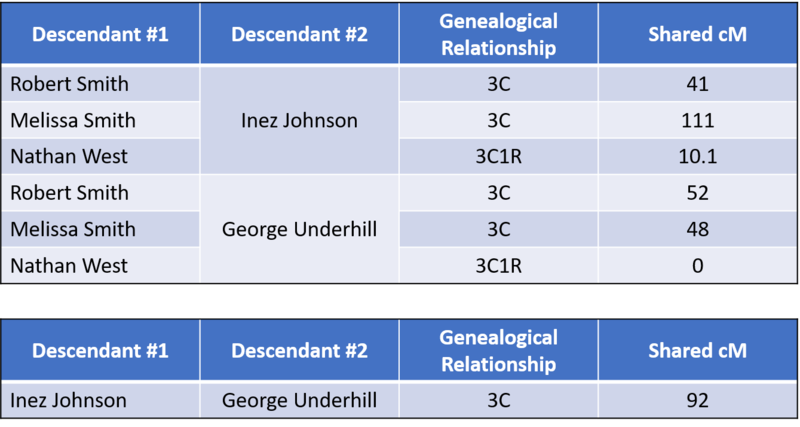 For example, Inez Johnson and George Underhill are descendants through two other children of Daley and Mary as shown in FIG. 1. With these results, I have DNA evidence that potentially supports documentation that Joseph, Harry, and Rose Clancy are siblings and children of Daley and Mary (Shane) Clancy. Now let’s bring in the DNA test results from Ephraim and Helen. Siblings Ephraim and Helen share about 2,700 cM with plenty of fully identical regions, making them full siblings as expected. This should raise many red flags, considering that there are a total of four different 2C relationships here that do not share DNA. As of today (March 13, 2017), no second cousin relationship (or closer) has ever been proven to share no DNA. Accordingly, there appears to be a misattributed parentage event in this tree somewhere. A final piece of information helped pinpoint which generation the MPE likely occurred. While Ephraim and Helen were testing, I discovered that their close relative, Jessica Roof, had recently tested. This was somewhat surprising. According to the 2016 data from the Shared cM Project, the average for 1C2R is 235 cM with a range of 27 to 413 cM. Although both numbers were well within the range, they were both almost half of the average amount. OK. Now, with this information and before you peek down below, can you come up with a scenario that explains the DNA results we’ve seen? Can you determine where the misattributed parentage event likely occurred? Scroll down when you are ready for my hypothesis, and see whether you agree. If we hypothesize that Benjamin and Pam were maternal half-siblings (with Pam being the daughter of Roger Clancy and his wife but Benjamin being a child of the wife and another man) then ALL the results could fit within that model. If Benjamin and Pam are maternal half-siblings, for example, that would mean that Ephraim and Helen are not biologically Clancys. Instead of grandfather Roger Clancy, another name should be there in the genetic family tree for them. Pam, however, is likely the child of Roger Clancy as described below. For example, this theory would explain why Ephraim and Helen don’t share DNA with any of their 2Cs or 3Cs (i.e., Melissa, Robert, Inez, and George). Ephraim and Helen are related to all of those individuals only through Roger Clancy, according to the tree. Because Jessica Roof is also related to all of those individuals only through Roger Clancy, her line appears to be correct (because she DOES share DNA with Melissa, Robert, and Nathan, for example). The theory also explains why Jessica Roof shares DNA with Ephraim and Helen, potentially at 50% of the average. If Benjamin and Pam were maternal half siblings, then Ephraim and Helen would be half 1C2R to Jessica. This is not as clear because the shared amount fits within the broad range for 1C2R, but it fits perfectly into the model. Thus, according to this theory, Roger Clancy had just one child – Pam Clancy – with his wife. Some years later, there was then a second child – Benjamin Clancy – born to the wife and someone else. Of course I don’t know the circumstances of this misattributed parentage event, and that is always an incredibly important consideration. This is, of course, just the beginning of the research. I can look for additional evidence that would support my theory, both DNA evidence and documentary evidence. Additionally, I can look for the father of Benjamin Clancy using existing matches in the testing database. (Of course, all names herein have been changed, as have a few other facts to avoid identification). Previous Article Can a Genealogist Refuse to Use DNA Evidence? Great explanation! I think a lot of times we’re running into the reverse situation – we’ve got DNA matches but we can’t find the MRCA in the related trees. I’d like to see a similar use of Ancestry DNA results that point to a tree but can’t find the MRCA – I’m suspecting, given sufficiently large trees, that we are encountering NPEs. Nice. It’s obvious Benjamin is not who he is supposed to be. Pity there wasn’t another male Clancy descendant and you could have sorted it out with only two Y-tests. But did you consider going back another generation or two and looking for more male Clancys? It’s the easiest and absolutely guaranteed. (You would need to triangulate with three Y-tests). It looks like your hypothesis can be affirmed from the results that you have. Does Jessica Roof also match Inez Johnson and George Underhill (although more distant than the relationship the Smiths and Nathan West)? Could another possibility be that Benjamin Clancy really is the biological son of Roger Clancy and that Benjamin’s children could be descended from Benjamin’s wife and another man? This answer should be a possibility, but is not suggested by the descendant chart they used that does not show spouses (except Mary Shane). This descendant chart could be correct through Benjamin Clancy, and should not include Ephraim and Helen. No, because then they wouldn’t be expected to share DNA with Jessica. Jessica’s results are what really pinpoint the relationships. Yes, great example. I wanted to scroll down at once but had to restrain myself. I was glad I didn’t since I figured it out. Couldn’t these kind of puzzles not be formalized into some automated program? Then the program could come up with alternative scenarios…. Yes, this is a perfect scenario for a computer program to do some analysis and present potential anomalies for further review. Unfortunately, coming up with an exhaustive list of alternative scenarios would be quite difficult due to the number of factors involved. I purchased your guide to DNA testing, and am gradually understanding the contents. For two years, I have been seeking the biological father of a friend with only DNA reports (uploaded to GEDmatch); distant cousins as matches; and a couple of weak clues to work with. I have charted numerous mirror trees, and now have a theory that requires the cooperation of a possible half-sibling. This places me in the role of the “skunk at the family picnic” as I attempt to get suspected close relatives to take a DNA test which might reveal marital infidelity. While a genealogy question begins as an intriguing, enjoyable puzzle, the fun is likely to transform into a harsher reality when you come closer to the correct answer. You may find yourself in that position with the “Clancy” family even though the MPE happened over a century ago. I am looking for ethical guidelines and advice on how to contact people who are suspected to be related to the biological parent of a client. I am quite good at solving puzzles; but when it comes to uncovering family secrets, success may come with a bitter taste. I am a descendant of the Mohawk Valley Bellinger’s, and would like to discuss that with you in a more appropriate forum.